Mingyi was born and raised in Jiangmen, a port city on the South China Sea with a population of four and a half million people. He became intrigued by ballet at the age of seven, when his parents decided that he was spending too much time watching TV and playing video games. Mingyi was placed in a ballet class, alongside a female cousin. His professional training began in earnest at the Guangzhou Art School. At 17, he enrolled in the Post Secondary Program at Canada’s National Ballet School for two years. In 2010, Mingyi was a competitor in the Prix de Lausanne, the Switzerland-based international competition for non-professional dancers aged 15 to 18. 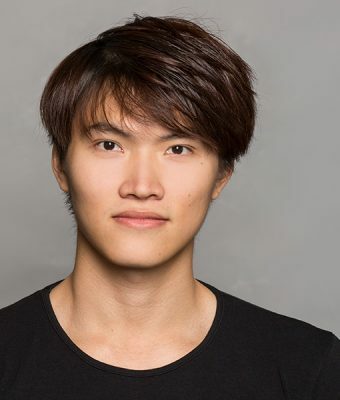 He has also competed in the 9th Taolibei Dance Competition, a national dancing competition in China, and in the Beijing International Ballet Invitational for Dance Schools. His roles include the variation solo of Albrecht from Giselle, which he performed at the Prix de Lausanne. During his time at the Open Stage with the National Ballet School he performed excerpts from 2nd Detail, variation from La Ventana, Here We Come, Evening Songs and Stepping Ground. In addition to ballet, Mingyi enjoys attending concerts and magic performances.